For slushy spring hikes, long approaches with heavy loads, or moderate spring mountaineering routes, you want a boot that's burlier than your summer approach shoes, but less cumbersome than winter mountaineering boots. This is the realm of light mountaineering boots, and the new Cevedale Pro GTX by Lowa is one of the burliest of its kind. This boot is optimized for hiking movement, but can smoothly transition to moderately steep terrain on rock and snow. Unlike a conventional mountaineering boot, the thick Vibram Dolent sole is rockered to allow for easy walking. On the trail, these feel more like a heavy hiking boot than a rigid climbing boot, and walk with a natural gait. The sole is designed with self-cleaning lugs that do a good job of retaining grip in thick mud, yet the boot retains a firm, exact front edge for scrambling on rock. The Cevedale Pro GTX boot is comfortable right out of the box. A stretchy tongue combined with a well-padded midsole helped them break in quickly, and a partial-length shank lets the boots flex for walking. Lowa offers a novel approach to balancing the tension between the forefoot and the ankle, which is critical for maintaining a snug fit while avoiding pain in the Achilles tendon. An inventive lacing system uses low-friction ball bearings in the eyelets which allow you to quickly cinch the boot around the lower foot, then lock off the laces in cam buckles at the ankle in a simple motion. You can easily achieve a secure forefoot fit while leaving the laces loose enough around the upper ankle for comfortable walking. I find these cam buckles don't slip even after many hours on the trail. During constant motion, these boots will keep your feet comfortable in wet conditions above temperatures in the teens. A seam-taped Gore Tex insert and wicking liner beneath the leather uppers make the boot fully waterproof and breathable, and while these interior layers aren't technically "insulated," the thick padding they provide around the foot offers more warmth than a standard hiking boot. I wore the Cevedale up steep snow couloirs, on muddy trails, and on a long day servicing field stations while standing in foot-deep icy sludge puddles and remained completely dry. There is no built-in super-gaiter, so wear gaiters if you're in thick snow. When the terrain gets steeper, these boots will perform like a light mountaineering boot should. They felt well-suited for early-season jaunts in the Colorado Rockies that involve booting up firm snow couloirs and crossing wet talus. The lacing system locks them tightly on your foot with no heel lift, and a firm forward edge allows precise foot placement. A rear welt makes these boots compatible with semi-automatic crampons, and the soles, while flexible enough to walk in, are stiff enough for kicking steps in steep snow or front-pointing up neve with crampons. I wouldn't recommend these boots for vertical ice climbing, but if I came across a short ice step on a spring mountaineering route and had steel crampons, I wouldn't be worried wearing the Cevedale. The aggressive lugged sole, thick padded midsole, and bomb-proof rubber and leather uppers do come at the cost of weight. At 1600 g (3.53 lb) per pair, this boot weighs up to 17% more than the lighter mountain boots on the market, like the La Sportiva Trango Cube GTX, and weighs about the same us the Trango Extreme Evo Light GTX, but without the insulation. In fact, the Cevedale weighs about as much as warmer, fully rigid mountaineering boots like the Sportiva Batura 2.0 or Scarpa Phantom Guide. The solid, heavy construction of the Cevedale Pro GTX sets it in a higher weight class than light-and-fast alpinists will want for mixed rock and snow/ice routes; however, the heft pays off in dependable durability. 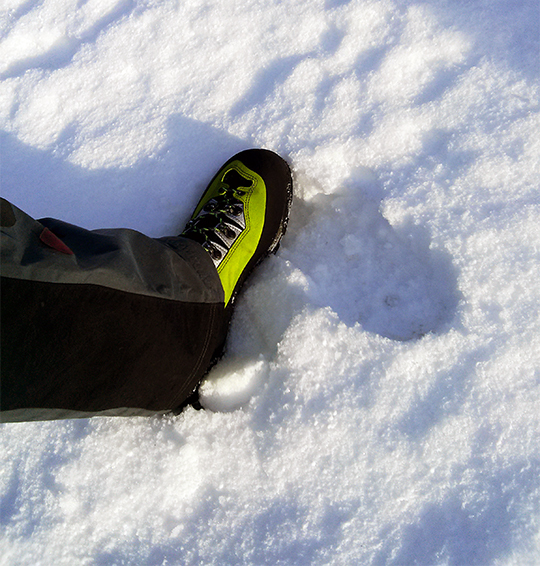 Lowa advertises "the ideal guide boot when versatility is paramount," a perfect description. The Cevedale Pro GTX is designed as an alpine workhorse, perfect for people who are logging lots of miles in wet and snowy mountain terrain, from climbing guides to weekend warriors. La Sportiva Trango S Evo GTX is 742 grams per boot,1484 grams per pair. Batura 2.0 GTX is 879 grams per boot.